There’s a lot of famous graphs in economics, but perhaps the Phillips curve will be remembered the most by anyone who experienced stagflation in the 70s and anyone alive today. It predicts that higher inflation correlates with higher employment. In all fairness, for much of the 20th century, that relationship held more-or-less true, and in fact the graph was based on that historical data. But the relationship broke during the stagflation of the 1970s, which saw both high inflation and high unemployment. The Phillips Curve has also broken down in the last decade, with both low unemployment and low inflation. What the heck is the Lucas critique? The Lucas critique basically says that models that aren’t founded on basic principles of human behavior breakdown because people learn how to game them. For example, if the Fed permanently raises the rate of inflation to increase employment, firms will realize what’s going on and adjust their wages and the employment rate will revert. 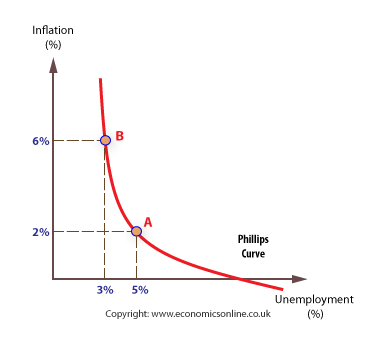 What do the Phillips curve and the Lucas critique have to do with marketing? It helps to explain why marketing strategies break down over time. Broetry has a distinctive style: one-line, single sentences of varying length that matches the emotion of the copy. Broetry is written in a way that appeals to mobile users, which make up the majority, and it tells a story of struggle, vulnerability, and how that person overcame the obstacles between them and success. Until it worked less and less well. You still see it quite a bit, but it doesn’t quite have the same impact as it used to and smart influencers have begun to evolve the tactic. What happened? Why did broetry lose its luster? 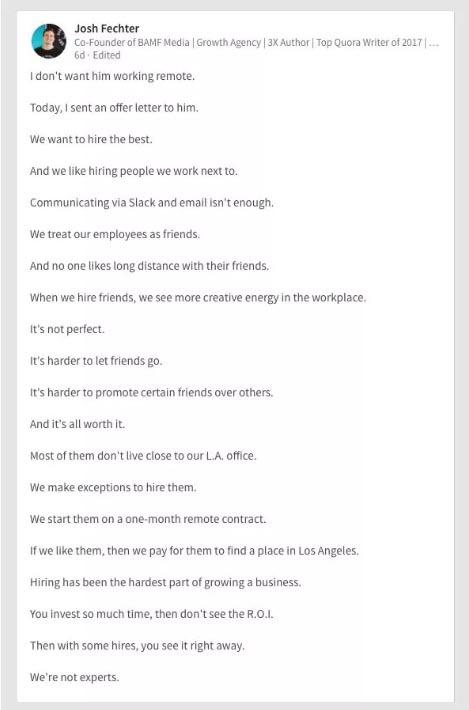 Marketers began to write in the broetry style not to share true struggles, but to take advantage of the technical aspects that allowed them to “beat” the LinkedIn algorithm. These messages began to lose their authenticity because for many broetry wasn’t about that — they wanted to exploit it. It was a very powerful tactic, and in some ways continues to be, but as it became the permanent “new LinkedIn order” people began to adjust their expectations. Just like with inflation, people began to see what was real…and what wasn’t. The tactic began to lose its connection with base human action, with the emotions that dictate our beliefs. You could tell from the comments people started leaving on the posts, like prosaic eye-rolling. Our ‘why,’ the reason we do what we do, the philosophy that drives our businesses and our relationships with our customers, doesn’t change. Well, it can change, if you change, but that is independent of marketing. The way we communicate that ‘why,’ that is our values, to our clients (current and prospective alike) must adapt. We choose certain formats of communication because we see that our audience hears us that way. Your audience will begin to associate the format with the message, like a pattern, so that they can recognize it at a glance and know they should listen. This success will be, and is, emulated by competitors — it’s just how the game works. Your competitors, who see the success in terms of ROI, will use the communication format because they see what emotion and feeling is associated with it, and they see that will also get their message heard, even if it’s not the same as yours. And this will dilute the power of the tactic, it will ruin the strategy for you. Marketing is, by necessity, experimental. It requires leadership, innovation, and at its core demands a willingness to fail so that you can learn and eventually succeed. There will always be marketing fundamentals, yet the substance cannot be cookie-cutter anymore. If the tactic has been exploited and it no longer resonates, you must look for way to set yourself apart again. New ideas are not guaranteed to work. That’s okay, there’s nothing wrong with an idea with results that didn’t quite meet your expectations. Marketing is very exploratory, it’s why we frequently conduct tests and experiments, to compare results from one tactic with those from another. It’s okay, a mistake is bad only if you don’t learn from it, because mistakes do just that — you have to know what doesn’t work to find out what does. As long as you are true to yourself, your mission, and your ideals, your marketing will be on the right path. This is part of being courageous. The goal is to communicate what you and your brand stand for, what changes is only how it’s communicated. You are audacious. You are bold. Let’s step into the future together.